Discussion in 'General Dog Discussions' started by Institute of Canine Biology, Jun 22, 2018. The degree of genetic similarity between two individuals due to common ancestry is the kinship coefficient (K). 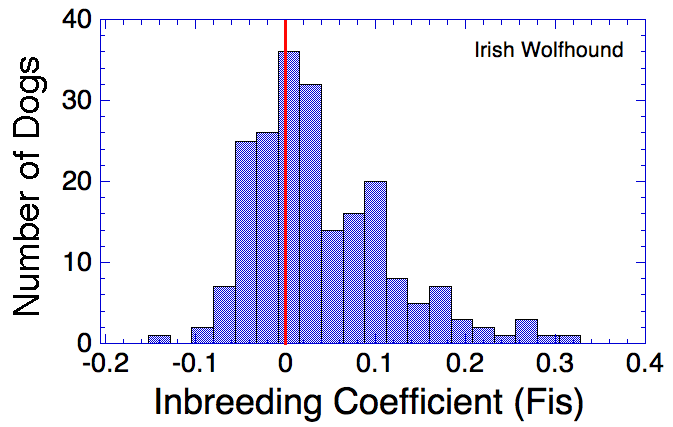 The kinship coefficient of a sire and dam is also the predicted coefficient of inbreeding of their offspring. 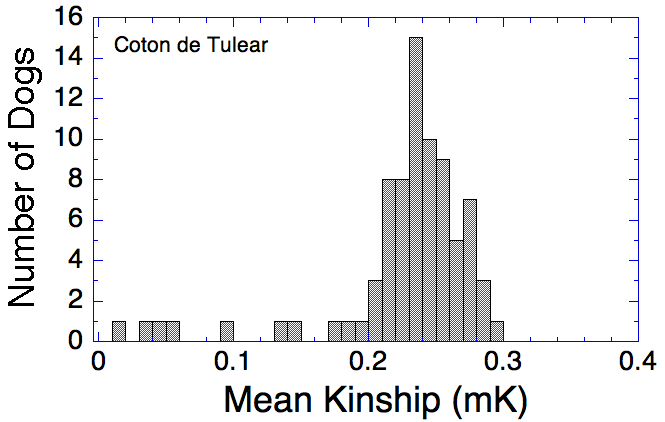 For full siblings from unrelated parents K would be 0.25, and their offspring would have an inbreeding coefficient of 25%. A kinship matrix displays the Kinship Coefficient of each individual with all others in the population. Ini this matrix, red indicates K > 0.25, yellow is K = 0.125, and green is K = 0.625. These correspond to full siblings, half siblings, and first cousins, respectively. 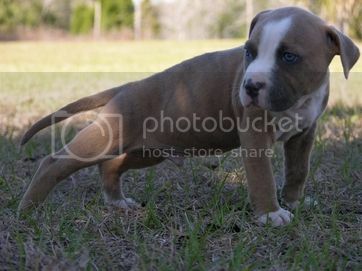 The degree of relatedness of animals in a population can be assessed as the average of the kinship of an individual with every other member of the population (mean kinship, mK). 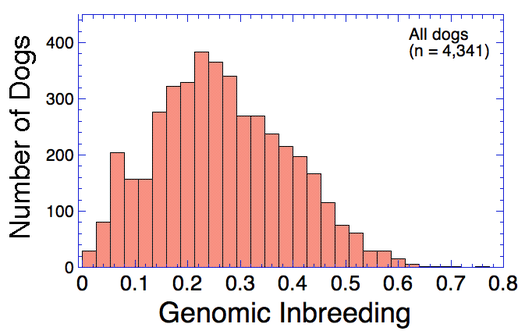 The genetic relationships among the animals in a population can be determined using the kinship coefficient, K, which reflects the alleles that are identical by descent (i.e., from common ancestors). 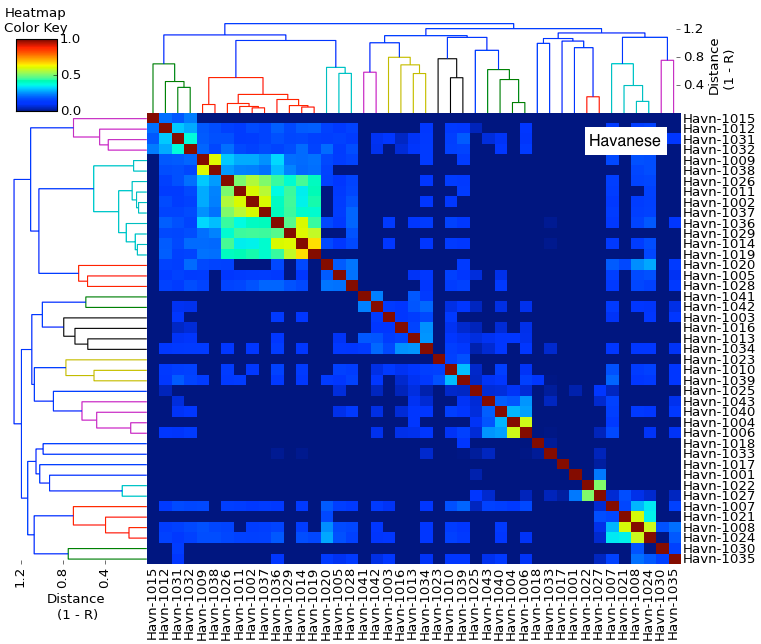 Genetic relationships are displayed as a dendrogram, the "family tree". Animals that are more closely related are connected by shorter branches. Relatedness is also indicated by the colors in the "heat map", in which blue is least related and red is most closely related. 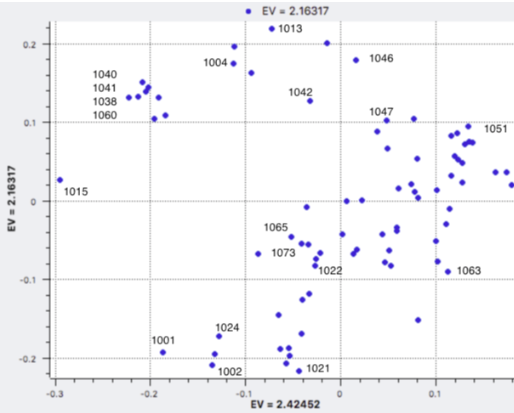 PCA is a statistical technique for revealing similarity or relatedness of individuals. The genetic difference between two individuals is the length of a line that connects them on the graph ("genetic distance").